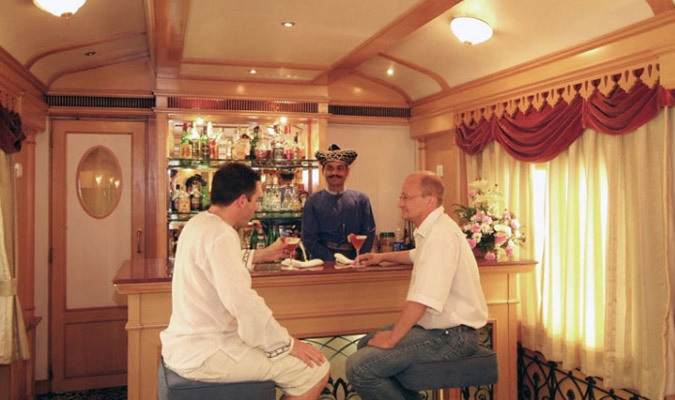 Deccan Odyssey is one of the luxury trains of India that offers a meticulously-planned journey called Indian Sojourn, an experience of royal luxury and style. This is a journey of 8 nights and 7 days that takes you to some of the best destinations of India.. Guests gather at the Chhatrapati Shivaji Terminus at 1530 hours and complete formalities related to registration and check-in. Then, you are greeted with a traditional welcome, accompanied by a welcome drink. Relax in your assigned cabin, once you are escorted to it by the staff. The train now departs for its first destination, Vadodara. Dinner and overnight stay onboard. Welcome to the capital of Gaekwads, settled by the Vishwamitri River- Vadodara. On reaching, breakfast is served onboard. Refresh and disembark for the first destination of the day- Champaner-Pavagadh Archaeological Park. This is a UNESCO World Heritage Site that dates back to the pre-Mughal era. The structures are completed and unchanged, but the essence of Islam is still not absent as one of its major attraction is Jami Masjid, which was built in 1513. This is one of the oldest mosques of India and shadows a blend of Hindu and Islamic styles of architecture. Return to the comforts of your luxury train for a leisurely lunch. Later, visit the Maharaja Fateh Singh Museum, originally served as a school for the children of royal households. This, today, is an art-aficionado's treasure, owing to the spectacular display of paintings by Raja Ravi Varma and other European masters, along with a collection of sculptures made of marble and bronze. Now it's time for high-tea at Laxmi Vilas Palace, the residence of Vadodara's Royal Family even today, dating back to 1890. The palace is four times the size of Buckingham Palace and boasts of a splendid Darbar Hall with Belgian stained-glass windows, mosaic floors and walls with mosaic decorations. Collection of terracotta by Fellici, bronze and marble sculptures, and old armory are put in display in the Palace. Guests are entertained with folk performances along with some delicacies straight from the Royal Kitchen. Return to the luxury train as it chugs off to its next destination, Udaipur. The train rolls into Udaipur today and guests are served breakfast before they set out to explore the beautiful city. Udaipur is often referred to as The Venice of the East and the City of Lakes, owing to its romantic backdrop of the Aravalis and imperturbable lakes. First site of the day is City Palace, the largest complex of Rajasthan; festooned with cupolas, scalloped arches and fretted balconies. The Crystal Gallery of the palace is a major highlight as well. This visit is made even more beautiful with a cruise on the Lake Pichola. Return to the comforts of the luxury train for lunch. Refresh and then again leave for a tour to the old city of Udaipur. The streets here are flecked with colorful knick-knacks such as wall-hangings, handmade papers, ornaments, paintings, painted wooden boxes, terracotta sculptures, puppets, toys and many such beautiful things. Return again to the Deccan Odyssey and have your dinner, as the train now departs for Jodhpur. Have your breakfast onboard as the train arrives in the region of Marwar. Jodhpur, the Sun City or the Blue City of Rajasthan looks bewitching with the rough backdrops of golden desert, Thar. Guests can wish to either stay onboard or leave for heritage-walk to a weavers' village, a potters' village and a Bishnoi Village. The Bishnoi Tribe follow 29 principles laid by their Guru 540 years back; their main focus is laid upon protection of trees and wildlife and to ensure the community has eco-friendly social life. The community has preserved their age-old cultures and skills, which you can get a glimpse of. If you are not keen about visiting villages, you can simply unwind in a spa at a five-star hotel. Lunch is served onboard. 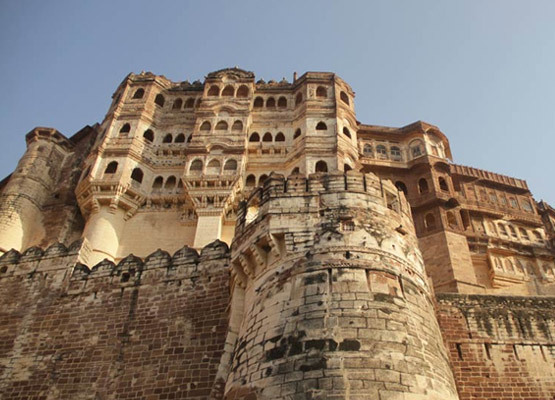 After this, guests leave to explore the city by walking through Old Clock Tower Market, havelis, houses and off course the one that cannot be missed, Mehrangarh Fort. 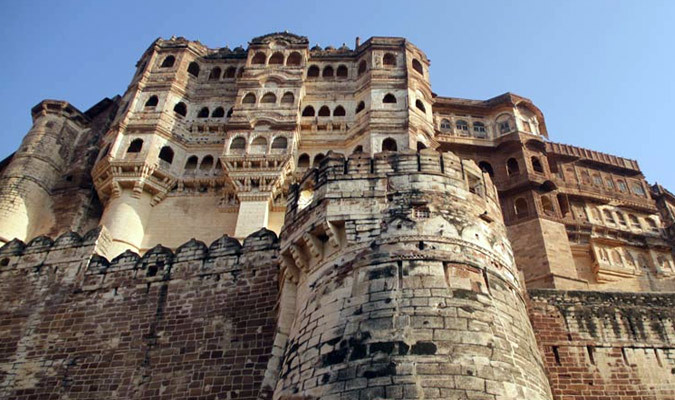 The Fort is a UNESCO World Heritage Site along with other Hill-forts of Rajasthan. This is among the biggest forts of India, standing with pride upon a summit and overlooking the rest of the city. It isn't just about ruggedness, intricate carvings and paintings inside the fort draw a blend of fragility and strength. In the splendid courtyards of the Mehrangarh Fort, Marwar barbecue delights are served for dinner. Return to the luxury train, as it further heads to Agra. Welcome to the city of Taj Mahal, Agra. Breakfast is served onboard, after which you deboard to visit the marvel of the city, Taj Mahal. This white-marble mausoleum is the Seventh Wonder of the World and stands as an epitome of brilliant architecture and true love. It was built by Shah Jahan for his beloved wife Mumtaz Mahal in the year 1632 and continued to be constructed for as long as 22 years. Later, lunch is arranged in a city hotel. Continue your sightseeing session after lunch and visit Itmad-ud-Daulah Tomb and Agra Fort. Itmad-ud-Daulah is also known as Baby Taj, built years before Taj Mahal by Nur Jahan for her father, Ghiyas Beg. 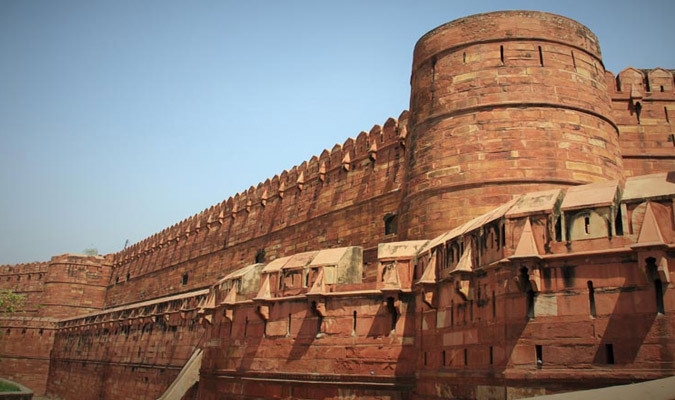 Agra Fort served as the seat of Mughal reign and administration for as much as three generations. Like many Mughal building this too is built majorly of red-sandstone, located at the banks of River Yamuna. As per historians, the present structure was built by Emperor Akbar and further additions were done by Shah Jahan and Aurangzeb. Diwan-e-aam and the Royal Pavilion are two of its major attractions which are surely worth a visit. After all this, you have a choice of either visiting local markets which are mainly known for Mughal ornaments and marble-inlay artifacts (Pietra Dura)/ or going for rejuvenation at a spa in a five-star hotel. Return to the luxury of the train as the dinner gets served and the train leaves for Sawai Madhopur. The train stations at Sawai Madhopur this morning. As soon as you finish your early-morning breakfast, head to the most popular attraction of Sawai Madhopur, Ranthambore National Park which also is a popular national park in North India mainly because of its population of tigers. Here, you can spot chital, sambhar, nilgai antelope, chinkara gazelles, wild boar, sloth bear, leopards, crocodile, jungle fowl, quails, crested serpent eagle, flycatchers, woodpeckers, storks, ducks, geese, etc. Return to the train and have your lunch. Freshen up and proceed for village safari. The people in the villages are mostly engaged in hunting and farming but one thing that defines them the most is their friendliness. After getting close to Rajasthani culture, it is time for high-tea at Sawai Madhopur Lodge, which formerly served as a hunting lodge for the royal family of Jaipur. Later, hop onboard, relax and sip a drink before the dinner is served. Deccan Odyssey today leaves for Jaipur. Overnight stay in the train. 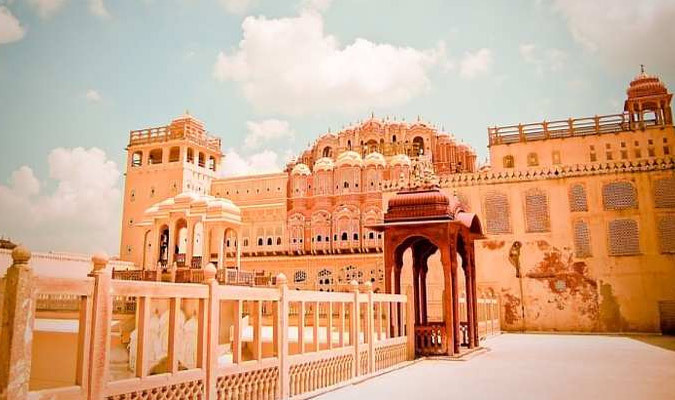 Welcome to the capital of Rajasthan, the Pink City Jaipur. The city is dotted with historic architectural marvels and colorful bazaars. 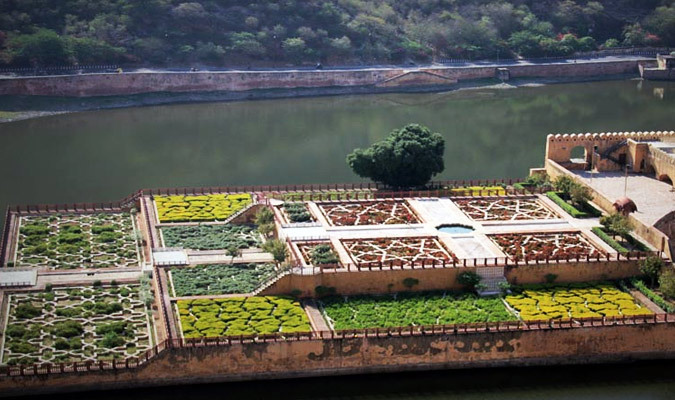 Once you have your breakfast onboard, head to visit one of the prime attractions of Jaipur, Amer Fort. This, along with other Hill-Forts of Rajasthan, is a UNESCO World Heritage Site. It was built in the 17th century by Maharaja Mansingh and still hasn't lost its charm. It is adorned with precious-stones, jali-work, paintings and mirrors. One of its main attractions, Sheesh Mahal, was where just a single source of light was reflected through mirrors in order to make it well-lit. Next in line is the iconic structure of Jaipur, Hawa Mahal. 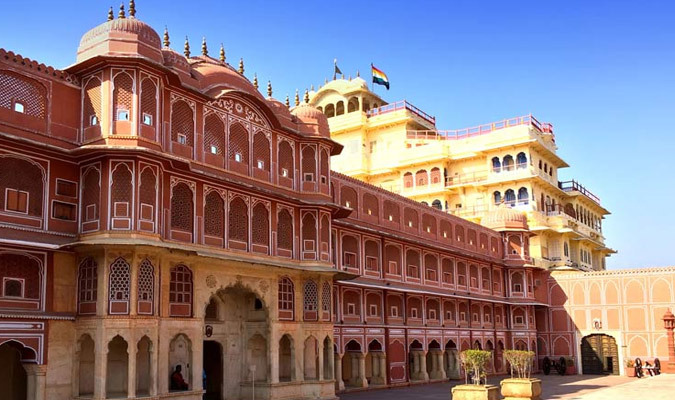 This red-sandstone palace has a façade filled with many small windows, which together look like a honeycomb. It was built for the ladies of royal households who wanted to enjoy the hustle and bustle of the local market, without getting seen by the locals. For lunch, visit a city hotel. After this you can either indulge in a spa or go shopping in the colorful local markets which offer a wide range of handicrafts and many such things. Return to the train as the day comes to an end. Dinner is served onboard as the train leaves for Delhi, the last leg of the tour. Early in the morning the train reaches Delhi Cannt Railway Station. Guests are served breakfast after which they disembark and bid farewell. Hence the beautiful journey comes to an end.